You could see the concentration on Katie’s face. 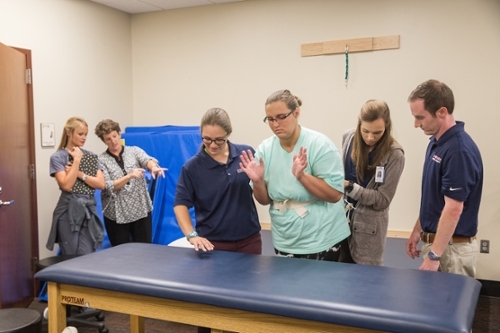 Surrounded by three Samford University Doctor of Physical Therapy students, she placed her hands on the table and lifted herself up into the standing position. After a pause, she raised her hands and burst into a joyous laughter. It had been more than a year since the accident that caused her traumatic brain injury, and every moment of progress should be celebrated with joy. Katie was one of 12 traumatic brain injury patients who attended the recent Alabama Head Injury Foundation’s Bright Ideas TBI Camp at Samford’s College of Health Sciences. With the help of 57 graduate students in Samford’s School of Health Professions and School of Public Health along with professionals in the community, these patients and their caregivers were able to receive additional therapy and support over the course of the three-day camp. Each patient was assigned to a team of Doctor of Physical Therapy and Master of Science in speech language pathology students along with a licensed occupational therapist. Each patient received assessment and therapy based on their individual needs. Scott Powell, executive director of the Alabama Head Injury Foundation, was thrilled with the camp’s attendance, including the caregivers who came with their loved one. On the camp’s second day, Master of Social Work students and faculty led counseling sessions specifically for the caregivers. During lunch on the first day, Samford’s cohort of dietetic interns provided a cooking demonstration, teaching how healthy options can be delicious and easy to make. “Obesity is a big issue in our population—and not just for the survivors. Caregivers can get worn out, and they tend to take short cuts and not think nutritionally,” Powell said. While the camp provided meaningful time for the patients and caregivers, it also made a strong impact on the students. “This population is so complex, and it was amazing to just hear each person’s story” Huey said. The camp also provided all of the students the chance to work interprofessionally, seeing first-hand how students in other professions work with the same patient. “I loved the chance to work alongside the physical therapy students and licensed occupational therapists. It gave me the chance to see not only what they do but why they do it,” said Allison Walker, a second-year Master of Science in speech language pathology student. The Alabama Head Injury Foundation is a nonprofit organization that supports roughly 2,900 TBI survivors across the state of Alabama, offering long-term support to patients and their families. Learn more at ahif.org.